These are very cheap and easy to make. You can make them in advance and keep in the fridge or else freeze them. Mackerel is an oily fish so a good source of omega 3 essential fatty acids, protein and minerals. Put a pan of lightly salted water on to boil. Peel the potatoes and cut into chunks about 2cm square. Put the potatoes in the pan, bring to the boil then simmer for about 8 minutes until the potatoes are done. Meanwhile, heat 2 tablespoons of vegetable oil in a frying pan and fry the leek over a medium heat for about 5 minutes, until it begins to colour. In a bowl, mix together the potato, leeks, parsley. Whizz the slices of bread in food processor to make breadcrumbs then remove to a large plate. Whizz the smoked mackerel and horseradish sauce together in the food processor then stir into the potato mix. If you don’t have a food processor, just flake the fish into chunks and mix into the potato mix with the horseradish. Divide the mixture so you have enough for 2 fishcakes per person. Roll into balls, then flatten like burgers. Coat both sides in breadcrumbs. Heat enough vegetable oil in a frying pan to cover the bottom. When it is hot, but not smoking, add the fish cakes and fry for about 3 minutes on each side . They can also be cooked in the oven, 180°C/350°F/gas mark 4. Drizzle the top with a little oil and cook for 15 minutes, turning halfway through. Add an extra 10 minutes if cooking from frozen. 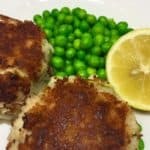 Cook the frozen peas as per the packet instructions and serve with the fishcakes and half a lemon. These fishcakes can be prepared in advance and kept in the fridge until ready. You can freeze these fishcakes for 3 - 4 months.